A harmonious synthesis of small cobblestone alleys and whitewashed houses, climbing the hill side defying all laws of gravity; beautiful majolica domes standing out in the sun’s rays, sumptuous Baroque style residence and avenue shaded by lush bougainvillea. A vertical landscape, an architectural fictional with strong seductive power, able to bewitch from the first moment anyone who linger himself in the narrow alleys of Positano, looking for the latest collection of leather sandals, linen clothes or ceramic items, produced by the creative genius of the Amalfi Coast artisans. Perched between terraced gardens of lemon groves and Mediterranean vegetation, the bay of Positano is protected by massive towers built during the Spanish viceroyalty (Trasita tower, Fornillo tower and Sponda tower); Li Galli, the three rocky and lonely isles of Gallo Lungo, the Rotonda and Briganti inhabited, according to tradition, by the charming syrenes, seducing sailors with their singing. Periodically visited by Tiberius, protected by Angevins with a small tower for deterring robbers, these isles have been the residence of Leonide Massine and Rudolph Nureyev. 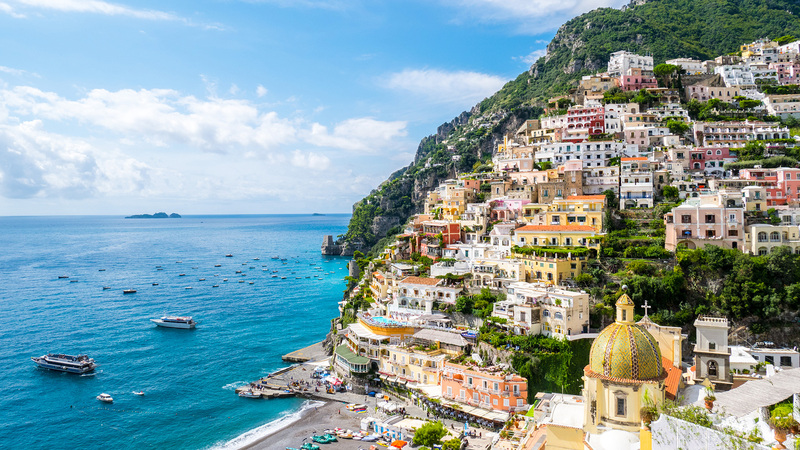 Positano was probably the oldest place of the Amalfi Coast, whose human settlements date back to the Paleolithic Age; the recent discovery of a maritime villa, belonged to a leading figure of the Roman senatorial class, reveals it was one of the favorite destinations by the Roman aristocracy. From the second half of the XIX century, Positano became buen retiro of both Italian and International artists. Positano is not just sea. The Natural Reserve of Vallone Porto, the Path of Gods, the excursions on Monte Comune as well as to Monterpertuso offer a wide range of charming itineraries in close contact with coastal and mountain landscapes to all trekking lovers.